Crystal-clear, durable Alūr™ Containers are made from 50% post-consumer recycled (PCR) PET plastic bottles for reduced environmental impact. Available in 8 sizes, ranging from 5 to 32 ounces, Alūr™ containers are engineered to be operation-friendly, durable and leak-resistant. 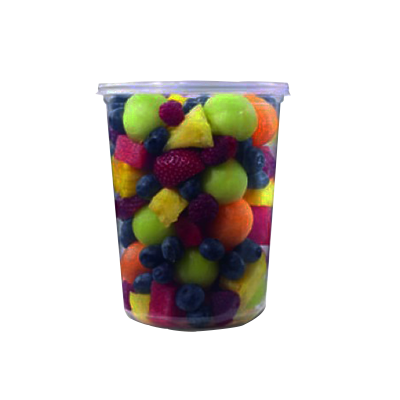 Crystal clear and made from PET, Fabri-Kal Cup Inserts pair with Kal-Clear® and Nexclear® Drink Cups and Lids to create the perfect multi-ingredient grab-and-go package. 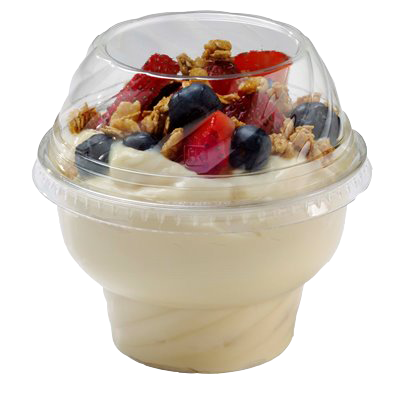 Yogurt and granola parfaits and veggies with dip are just two of many exciting ways to use this innovative plastic container. Performance, clarity and sustainability in one beautiful compostable cup. That’s Greenware®, Fabri-Kal’s exclusive line of crystal clear premium cold drink cups, lids and portion cups, made entirely from plants—not petroleum. 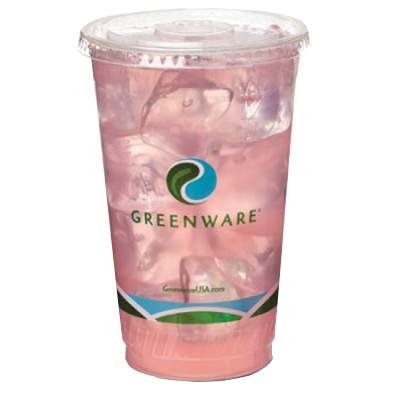 Greenware® Cold Drink Cups are sturdy and attractive, ranging in size from 7 to 24 ounces. They’re also 100% compostable. A great choice in sustainable packaging. Indulge™ Dessert Containers and lids are made from a minimum of 20% post-consumer recycled PET plastic bottles. You can help reduce plastic destined for traditional waste streams and preserve natural resources with the Indulge™ line of green packaging, designed just for desserts. Versatile “swirl” dome lids with holes are ideal for frozen confections. Tall flat-top dome can serve as a treat dish. Greenware® is Fabri-Kal’s exclusive line of crystal clear premium cups, lids and portion cups, made entirely from plants—not petroleum. Greenware® Portion Cups come in 3 popular sizes and are 100% compostable. A great choice in sustainable packaging. Greenware® is Fabri-Kal’s exclusive line of crystal clear premium cups Lids and portion cups lids, made entirely from plants—not petroleum. 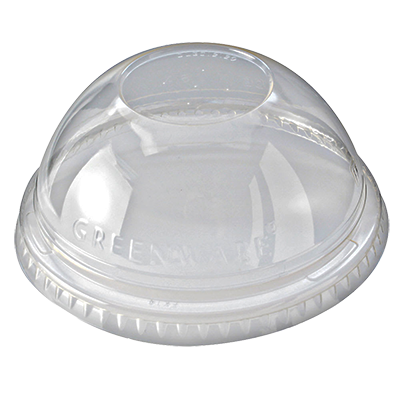 Leak resistant Greenware® Cold Drink Cup Lids are available in styles to suit your application. 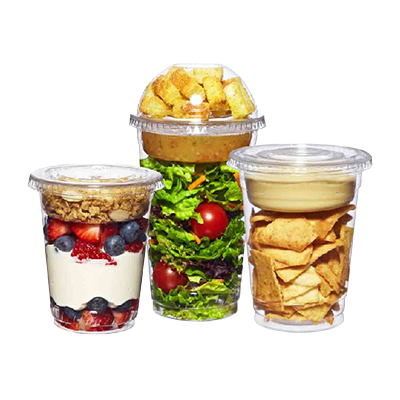 Make your sustainable packaging complete with crystal clear, compostable cup lids from the Greenware® line. 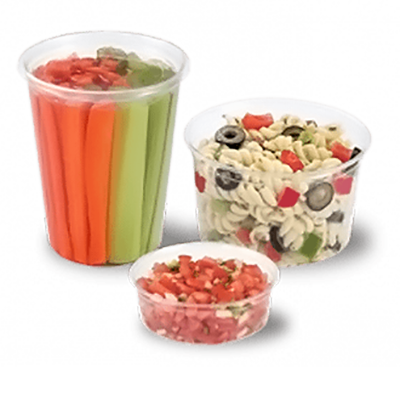 Contact-clear and microwavable, Pro-Kal containers are round deli tubs made of durable polypropylene. Available in 7 sizes, ranging from 5 to 32 ounces. Two lid styles fit the 6 most common containers. 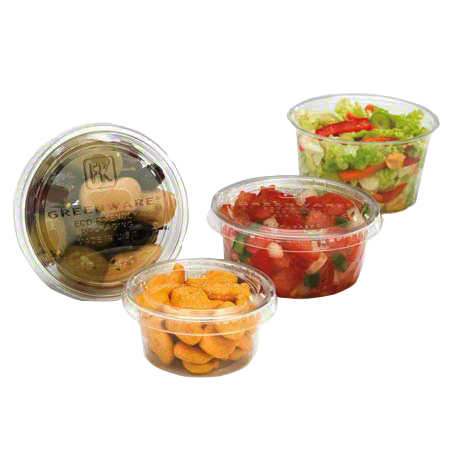 A lightweight and cost-effective plastic packaging choice. At Fabri-Kal, their experienced thinkers and problem-solvers who are dedicated to finding your best product packaging solution. They listen. So they learn what’s most important about your business. They collaborate To identify more issues, uncover more ideas and find your best stock or custom packaging solution. They deliver Expertise Quality. And unsurpassed customer service.